Send your sincere expression of sympathy and support for a loved one during their time of loss with this sturdy Sympathy basket that’s filled with Succulent D'Anjou Pears, Crisp Fuji Apples, Fresh Satsuma Mandarin Oranges, Fiscalini® Farmstead Cheddar,Vella Mezzo Secco Dry Jack Cheese, Olive Oil Crackers, Bakery-fresh Baklava, Earth & Vine® Provisions Apple Cranberry Pear Chutney, Columbus® Dry Salame and much more. And it all arrives, lovingly handpicked and hand-packed, in this hand-woven fabric-lined willow and rope gift basket. 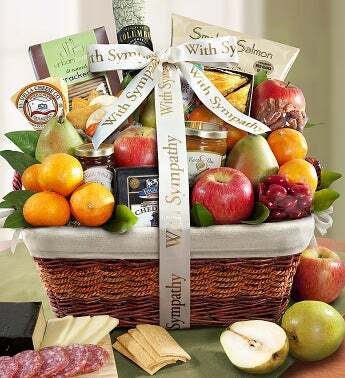 Easy to share, this delectable gift arrives orchard-fresh, ripe and ready to eat! Send your sincere expression of sympathy and support for a loved one during their time of loss with this sturdy Sympathy basket that’s filled with Succulent D'Anjou Pears, Crisp Fuji Apples, Fresh Satsuma Mandarin Oranges, Fiscalini® Farmstead Cheddar, Vella Mezzo Secco Dry Jack Cheese, Olive Oil Crackers, Bakery-fresh Baklava, Earth & Vine® Provisions Apple Cranberry Pear Chutney, Columbus® Dry Salame and much more. And it all arrives, lovingly handpicked and hand-packed, in this hand-woven lined willow and rope gift basket.